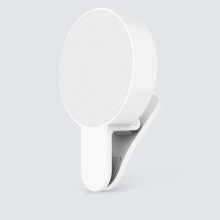 This Xiaomi Yuemi Self-timer Fill Light have natural and uniform lighting fir take self-pics. 9 hight brightness LED lamps with 5000k color temperature, providing softer lighting. Three adjustable lighting mode for different scence, such as Back-lighted shot, dark environment and live video. Minimalist design, anti slip and easy operation with Micro USA Charging. Easy operation: Dual functional silicone button is setting in the top of back. Long-lasting for all day using: Universal Micro USB charging, one full charging can lighting all day when travel.